Buff Daddy is a must have for any man who wants to have a great looking physique. 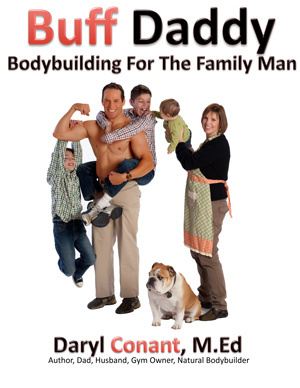 Buff Daddy is a complete body building program. One of the most forgotten and underrated exercises. The pullover part works one part of the triceps. (Try them by themselves and see the pump –use 2 sets of 12-15 reps with moderate heavy weight). If you combine this with a close grip bench after the pullovers the p[ump is unreal. The amount of weight you can use may shock you initially as it will be rather “low” . Maybe that is which people hung up on poundages scorn it. Google in John McWilliams a lifter/bodybuilder from the 1940s-1950s at his peak and look at those arms. He was a real enthusiast for the bent arm pullover and press. He was one of the first people to bench press 500 and had a true 21 inch plus arm back in the pre-steroid days. Google his name in and loot at those arms and it shows pictures of him benching near or at 500. I use it on a basic exercise Z or Z-curl bar. I always warm up at my age 64 as this exercises really stretches the upper body and thorax so no muscle pulls needed. I use a grip of about 5 inches. Tony Pearson a former Mr. America in the late 1970s used this exercise often. I perform 12-20 reps of bent arm pullovers- maximum weight (after a proper warm-up) by themselves. At the end of those reps I then do many bench presses as I can after that. The pump is unreal. The outer areas of the pectoral are worked on me as they are often sore after one of these workouts in addition to the lats getting a good stretch and workout. Finally, the bent arm pullover has helped many people overcome shoulder pain and problems from injuries if used strictly and in good form. John McWilliams a huge enthusiast of the bent arm pullover form the 1940s and 1950s.